Chris has established himself as one of the UK’s foremost entertainment organists – both on pipe and electronic instruments. Born in Manchester in 1971, the Powell family emigrated to the South Island of New Zealand when Chris was just 2 years old. His first musical memories were in NZ when, as a pre-schooler, he took great fascination in a tour of the workings of the school chapel pipe organ. Upon the family’s return to England in 1977 this fascination was further nurtured by the commencement of organ and piano lessons as well as many hours spent as a keen chorister right throughout his schooling. By the time he was 16, he was already in demand to play for concerts and dances in the East Lancashire/West Yorkshire area which ultimately led to the realisation of his ambition to join the team of organists at the world famous Tower Ballroom, Blackpool. 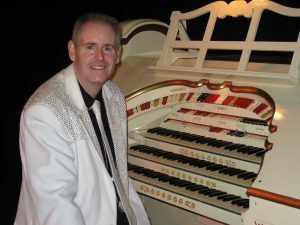 Chris enjoyed two happy seasons there playing the mighty Wurlitzer and electronic organs and has been fortunate to give several performances for both concerts and dances on that most famous theatre organ over recent years. From his first appearance at Blackpool invitations quickly poured in from both near and far for concert appearances. These rapidly saw Chris in demand to travel to all corners of the British Isles including the Channel Islands and Isle of Man. There also came chances to work with a number of celebrities during this period. He was very honoured to have been asked to play for events in Blackpool with the ‘Princess Royal’ and former labour Party Leader ‘Neil Kinnock’ as well as providing musical accompaniment to scenes in the TV. programmes ‘The South Bank Show’ which was profiling Thora Hird and also ‘The Big Breakfast’ with ‘Keith Chegwin. Radio appearances have been numerous both on local radio stations in the UK, New Zealand and Australia as well as many tracks of his recordings being featured on BBC Radio 2’s ‘The Organist Entertains’. Chris has recorded 12 best selling albums to date with his latest featuring the stunning Roland Atelier AT-80S – ‘Inspirations’. Chris married his wife, Marie in May 1998. A former Yamaha Music School teacher, they now run their own promotions company in Derbyshire.